How are Academy Points calculated? A combination of the number of classes, combos, scenery points, appeal, classes, graduation count, students and professors unlocked. Currently, the students’ graduation count resets every year on Month 8. 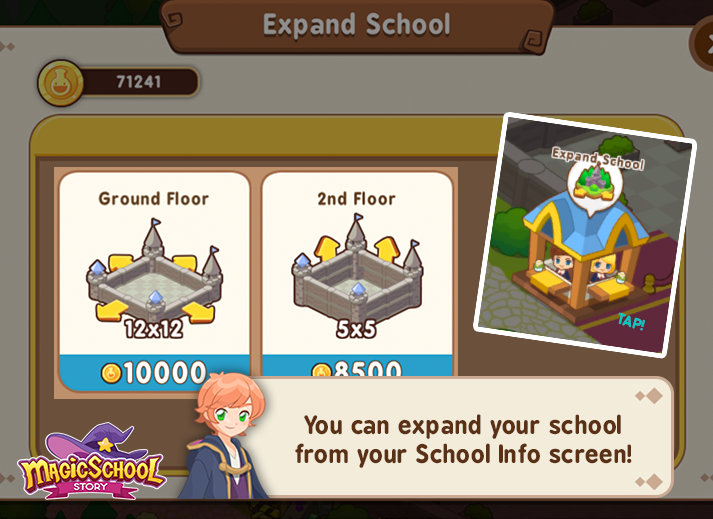 Students will graduate on Month 8 of every School Year when they reach Lv 9 Max EXP. ​How do I get new professors? When special students graduate, they will come back to your school as professors. Always invest to unlock new student groups! 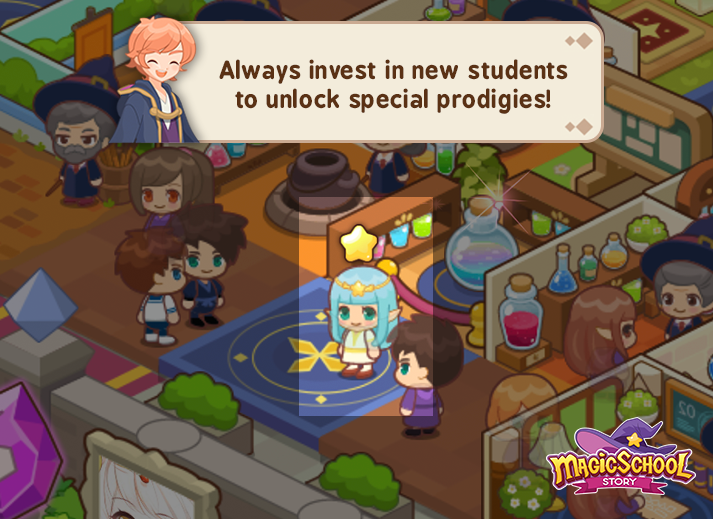 ​I unlocked new students but they aren’t appearing in my school! Please wait for the current batch of students to leave the school, and new students will enrol after that! 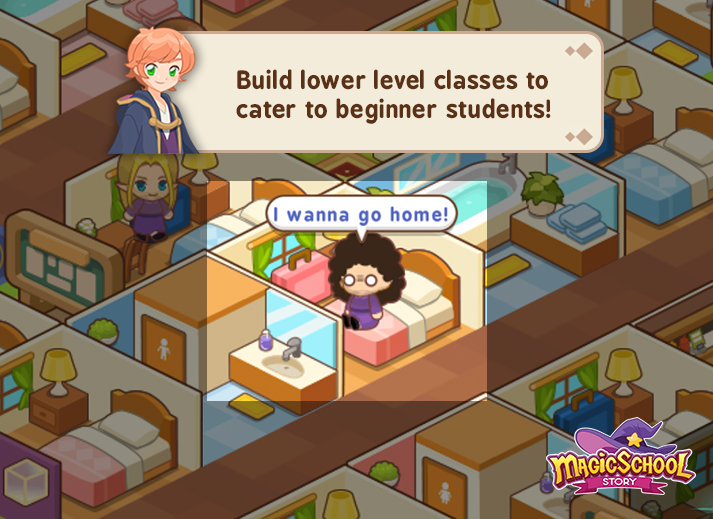 You can also build more Dorms, this allows more students to enrol. How to get a blue bed for the Basic Dorm? 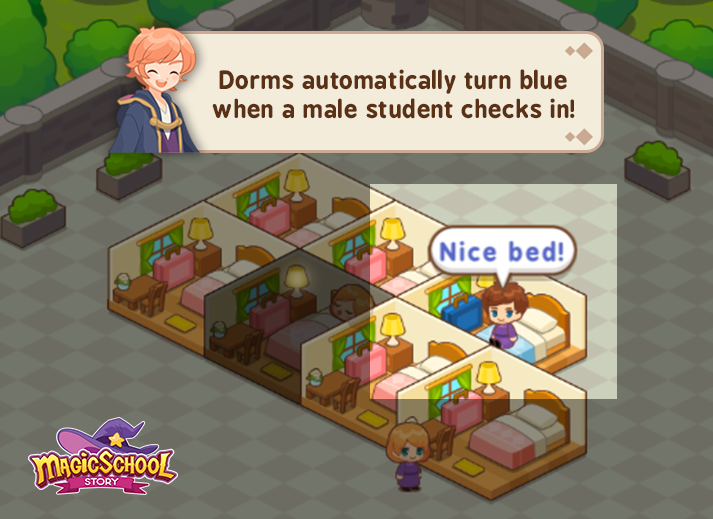 Your Dorm bed will automatically turn blue if a male student checks in! 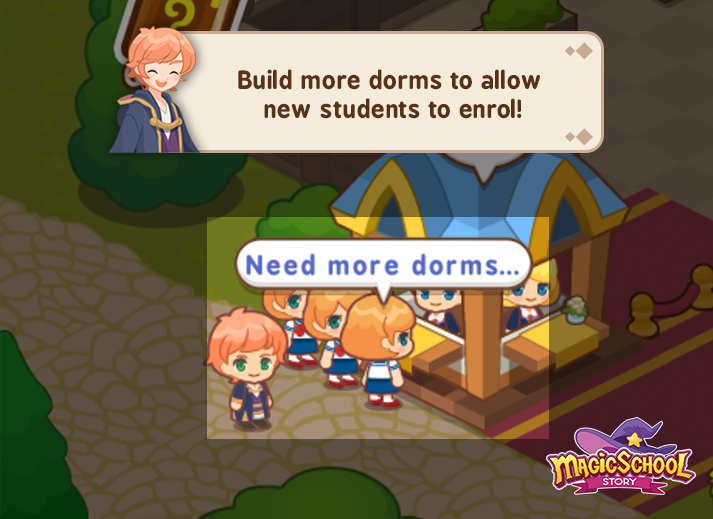 You don’t have to build separate male Dorms, just build more Dorms! ​How to make second floor accessible? 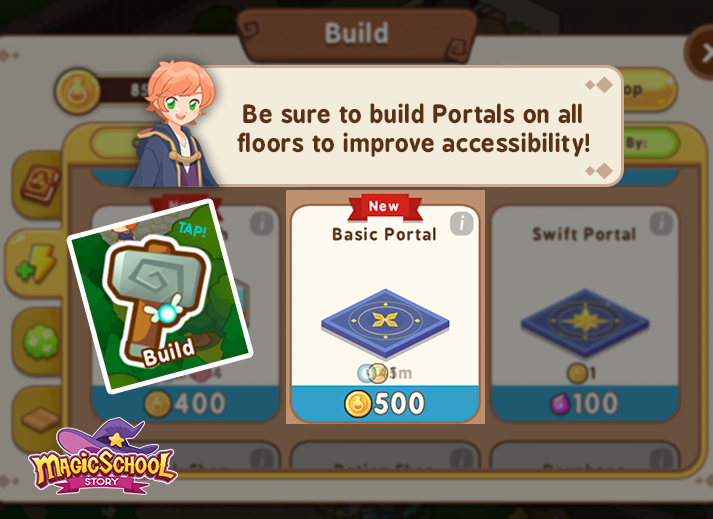 Please build a Portal in each floor so that students can teleport up and down! You can also build more than one portal on each floor. In "Build" Menu on Bottom Left, Select "Facilities", Scroll down, Select "Portal"! Please go to School Information (building outside school with blue roof) > Expand Land. 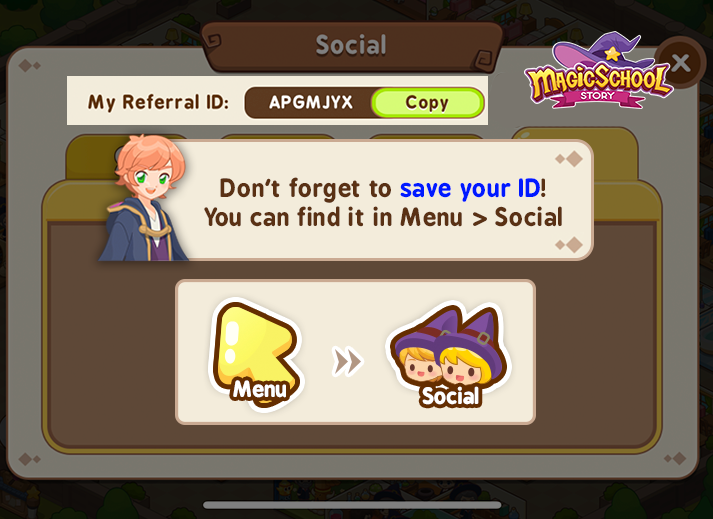 The person you invited must become an active player before inputting your Referral ID. Freshly created accounts will not work. 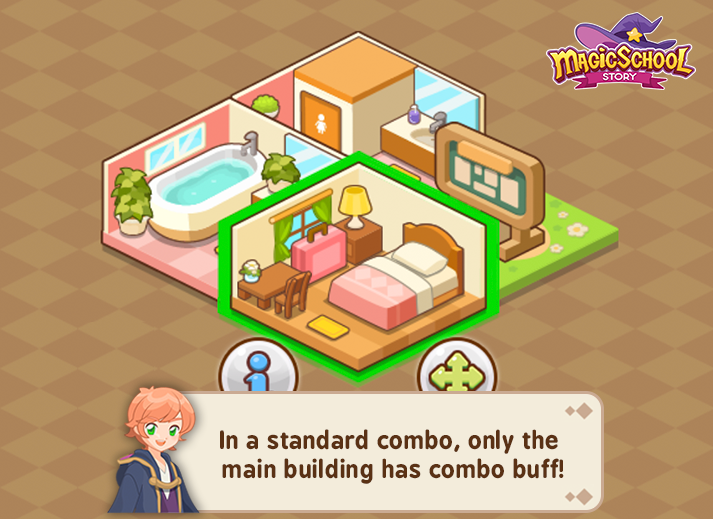 Combo bonuses only applies to the main building, and does not apply to sub buildings. What can I do when students say “I’m hungry!” or “Need to find a toilet”? 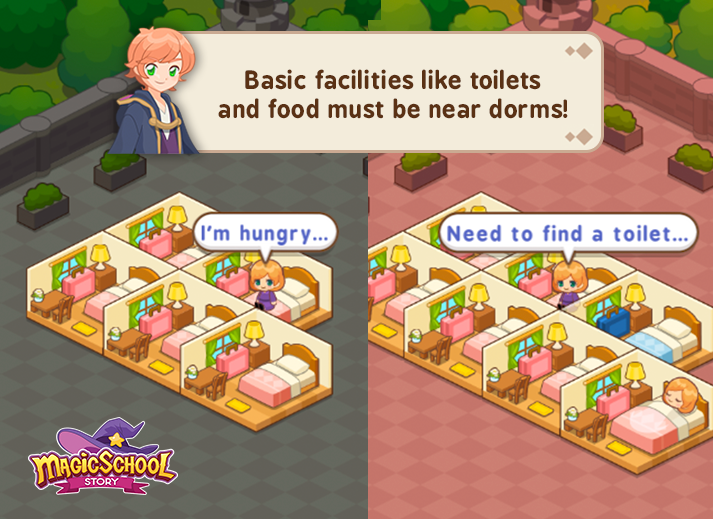 When students get hungry or can't find the toilet, it means the facility is too far away from the dorm. For now they'll leave the school and come back later. You'll need to build them nearer to the Dorm. This means that they recently failed a spell-cast. After a while, they will exit school to heal. Be sure to keep low level classes in your school to reduce the number of bomb-heads. Why do the students walk and suddenly disappear? This usually happens if you have just changed your portal position or moved your Dorm to storage. The students are still using the old pre-set path to reach their destination. After a while, the students will re-enrol to your school by registering at the reception. How to collect all coins? There is a investment quest which you can unlock at higher levels that allows you to collect all coins with a button. Please gather elemental orbs from Mine, Adventure and Puzzle Game. Then, you can upgrade your classes. Lv3 classes will be released in v2. What does Orb Trader do? 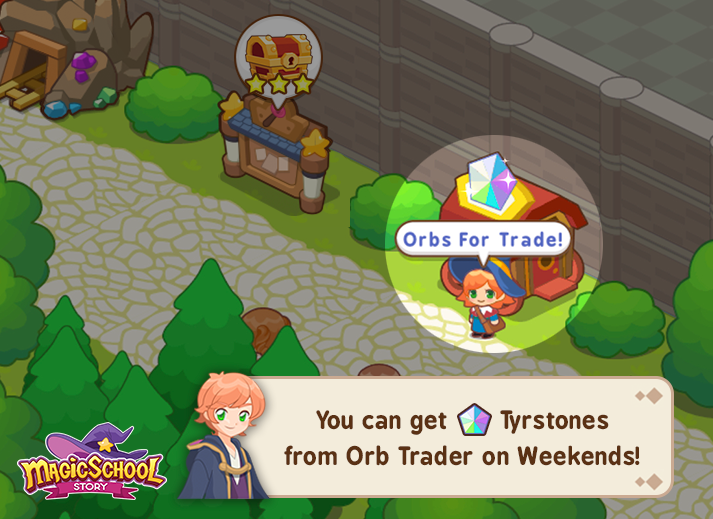 On weekdays, Orb Trader allows you to trade unwanted Elemental Orbs into the Orbs of your preference. 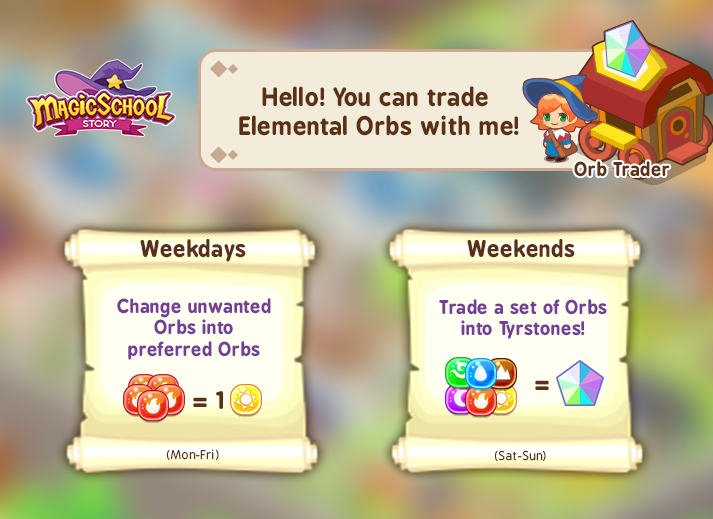 On weekends, you can trade a set of Elemental Orbs for Tyrstones! How do I get Orb Trader? What are Tyrstones for and how do I get them? 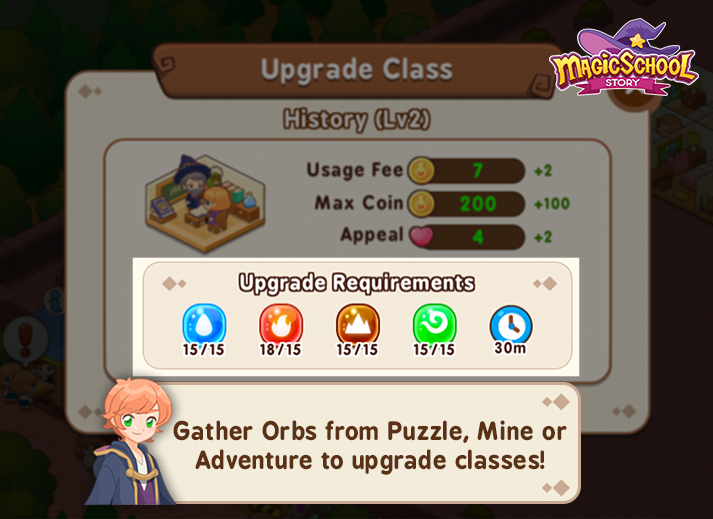 Tyrstones are important resources used to upgrade classes to Lv 3. You can get them by trading with Orb Trader on weekends. There is also a very small chance you can get Tyrstones from Adventure. 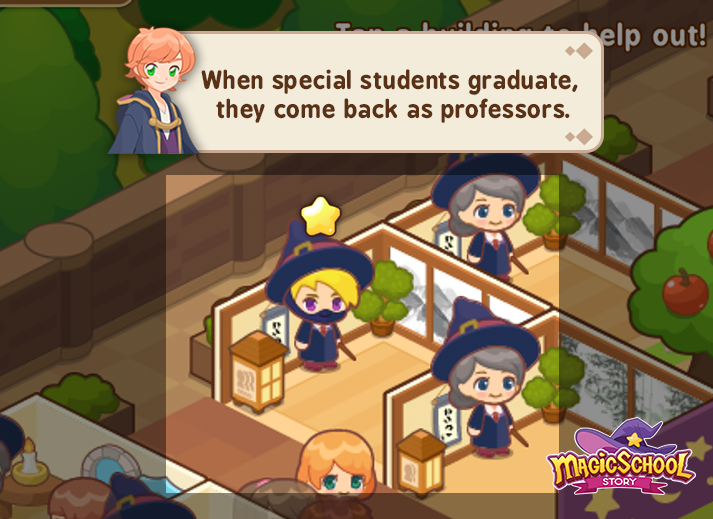 From time to time, there will be events ongoing in Magic School Story! 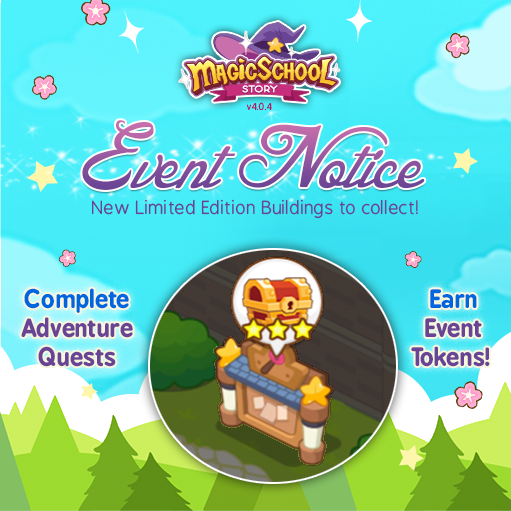 During the event period, earn event tokens from completing Adventure Quests to get special limited edition classes, facilities, decos and tiles! Each event usually last two weeks. Don't miss them! Sometimes your game might suddenly go to level 1 due to various reasons. ​If you’ve lost your game, please contact us at ashley@happylabsfree.com with as much information about your game as you can, and we’ll try to help you. 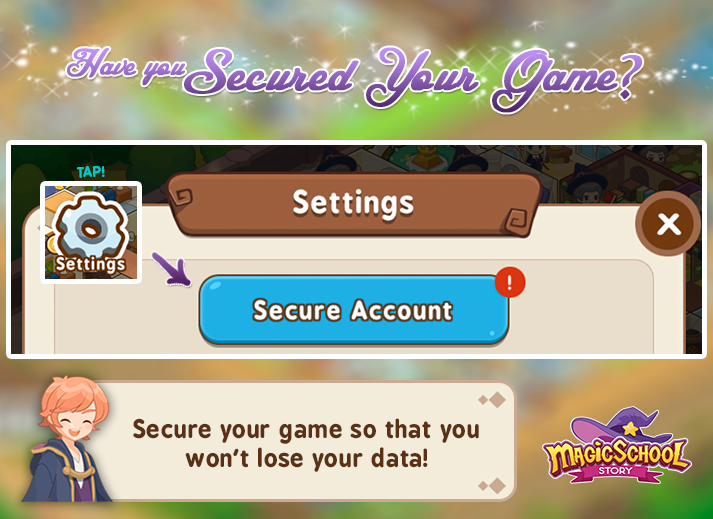 Just in case, always remember to Secure Your Game in Settings, and also Save Your ID!